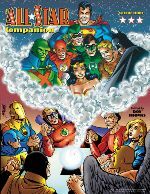 All Star Companion Volume 3/238 pages & $26.95, TwoMorrows Publishing/Roy Thomas, editor; various writers & artists/ available at comics shops and at www.twomorrows.com. There have been pivotal events in the history of comic strips and comic books. Among them are the creation of the first superhero, Superman, of the first non-super powered costumed hero, Batman, and the first female superhero, Wonder Woman. If you?d like to learn everything about the Justice Society and its spin-off characters and titles, there is no better source than the first three volumes of All-Star-Companion. If you want to learn everything about the editors, writers and artists who brought the Justice Society and its spin-off characters and titles to life since the 1940s, that information is also there. The third volume has just been released. Inside this volume are hundreds of art examples, creator photographs, biographies, and interviews of various lengths, and just a huge chunk of comics history fact and debunked fallacy. These volumes are literally hog-heaven for die-hard comics fans, and those looking to die-harder than they've been in the past. Because there are very few current characters whose creation and history are not rooted in the first and related super teams, you are certain to find fascinating information about your particular favorites as well. It will be a cold meal, however, for casual comics readers who have no favorites.